Persistence Market Research (PMR) analyzes the busbar trunking systems market, in its new publication titled, 'Busbar Trunking Systems Market: Global Industry Analysis 2013–2017 and Forecast 2018–2026'. This study provides data for 2017, along with a forecast for the period 2018–2026. The main objective of the busbar trunking systems market report is to identify trends and the historic market scenario, and provide recent updates and insights affecting the various segments of the global busbar trunking systems market. To provide a better understanding of the busbar trunking systems market, the report also includes the analysis of drivers, restraints, and trends across six regions/countries - North America, Latin America, Europe, Asia Pacific, and the Middle East and Africa. To understand and assess the busbar trunking systems market opportunities and trends, the global busbar trunking systems market report has been categorically split into different sections based on the product type, application, conductor material, and region. The busbar trunking systems market report starts with a market overview, and provides a market definition and taxonomy, along with value chain, pricing analysis, drivers, restraints, and trends in the market. The sections that follow include the global busbar trunking systems market analysis by product type, application, conductor material, and region. In the final section of the report, a competitive analysis of the busbar trunking systems market has been included to provide report audiences with a dashboard view, categorized on the basis of providers present in the value chain, their presence in the busbar trunking systems market, and key differentiating features and strategies. The primary type of providers covered in this busbar trunking systems market report include busbar trunking system suppliers and manufacturers. Report audiences can gain segment-specific vendor insights to identify and evaluate key competitors on the basis of the in-depth assessment of their capabilities and success in the busbar trunking systems market. Detailed profiles of providers have also been included under the scope of the report to evaluate their long- and short-term strategies, key offerings, and recent developments in the busbar trunking systems market. 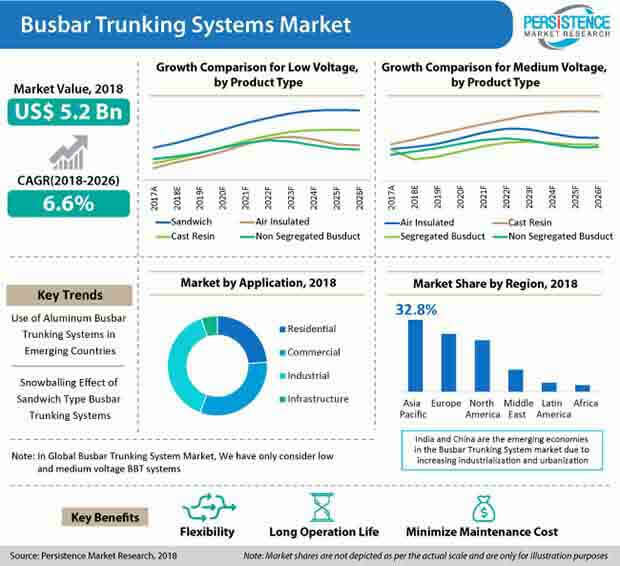 Some of the key market participants reported in this study on the busbar trunking systems market report are ABB, ALFA Technologies Pvt Ltd, Anord Mardix Inc., C&S Electric, DAVIS, DBTS Industries Sdn Bhd, DKC Europe s.r.l., DTM Elektroteknik A.S., Dynamic Electrical Sdn Bhd, E+I Engineering (Powerbar), EAE Elektrik, Eaton, Effibar, Elecsis Ltd., Energypac Power generation Ltd., Entraco BKS, Furutec Electrical Sdn Bhd, Gersan Elektrik A.S., Godrej Industries Ltd., Graziadio, IBAR EMEA Ltd., KYODO KY-TEC Corp, Larsen & Toubro Limited, Lectobar, Legrand, LINKK Busway Systems (M) Sdn Bhd, LS Cable & System Ltd., MEGABARRE EUROPE SRL, NATUS GmbH & Co. KG, NAXSO S.r.l., NISSIN ELECTRIC Co., Ltd., Pogliano BusBar s.r.l., Power Plug Busduct Sdn. Bhd., RTC-ELECTRO-M Ltd., Schneider Electric, SIEMENS AG, Stardrive Busducts Ltd., TAIAN-ECOBAR TECHNOLOGY, Vass Electrical Systems, and WEG, among others. For the busbar trunking systems market data analysis, we have considered 2017 as the base year, with market numbers estimated for 2018, and a forecast made for 2018–2026. We only consider low and medium voltage busbar trunking systems for calculating the market size. The volume given in the busbar trunking systems market research report is in meters. To calculate the market size, the report considers the weighted average price of busbar trunking systems based on conductor material and product type across key geographies on a country basis. The forecast evaluates the total revenue (US$ Mn) and volume (meters) of the global busbar trunking systems market. To deduce market value size, the cost of each conductor material has been considered, along with the variation in price in each region. In order to provide an accurate forecast, we started by sizing up the current market, which forms the basis of how the global busbar trunking systems market is expected to develop in the future. Critical market data, including the base number and segment splits, has been devised through in-depth secondary and primary research. This data was then triangulated on the basis of different verticals, considering both, supply-side and demand-side drivers and other dynamics of the various regional markets, along with primary interviews of manufacturers and industry experts operating in the global busbar trunking systems market. The forecast presented in the report evaluates the actual cost of busbar trunking systems, and the cost by brands in the global busbar trunking systems market over the forecast period. PMR has developed a market attractiveness index to understand the key segments in terms of their performance and growth in the global busbar trunking systems market. This market attractiveness index would help clients identify real market opportunities in the global busbar trunking systems market. The global busbar trunking systems market generated the revenue of approximately US$ 5 Bn in 2017, which is expected to grow at a healthy CAGR of 6.6% during the forecast period, 2018-2026. Increasing automation in end-use industries and the high rate of compliance to the ICE (the International Electrotechnical Commission) standards for improved safety and operational life are a couple of primary factors that are expected to create significant opportunities for the manufacturers of busbar trunking systems over the projected period. A busbar trunking system keeps the gas in the tank and prevent it from evaporating, as gasoline has a tendency to evaporate at fairly low temperatures. It is estimated that, around 20% of vehicular emission is the result of evaporation. Thus, the federal government has imposed regulations in order to prevent the evaporation of gas in the atmosphere. Steel busbar trunking systems are thus expected gain traction in the market, as manufacturers are adopting advanced piston rings for vehicle engines to meet government standards such as the Euro 6 environmental standard that aims to reduce vehicle emission, in particular, NOx (Nitrogen Oxide) and particulate matter. These factors are expected to fuel the growth of the busbar trunking systems market. Automotive, construction, electronic, machining, oil & gas, and chemical processing industries, among others, represent potential growth opportunities for the manufacturers of BBT systems. Emerging economies such ASEAN, Brazil, China, and India are driving construction and industrialization, globally, which, in turn, is expected accelerate the growth of the busbar trunking systems market. Busbar trunking systems find application in multiple end-use industries, especially the textile industry and power plants, as these systems are compact in size and provide a single run for multiple circuits. Moreover, these systems require shorter installation time as compared to cables, and have minimum operating costs. These factors are expected to propel the demand for BBT systems in end-use industries such as oil & gas, commercial sector, and high rise buildings. The construction industry is expected to boom more in certain countries/regions, such as ASEAN and India, as compared to developed economies. This can be mainly attributed to increasing urbanization and stable economic conditions in these regions. Rising urbanization, leading to new infrastructure and commercial activities, is further expected to boost the demand for smart power distribution systems. Increase in the demand for smart power distribution systems will further give traction to the growth of the busbar trunking systems market. The global busbar trunking systems market is fairly consolidated, with key manufacturers accounting for a substantial market share, as of 2017. In the recent past, the busbar trunking systems market has witnessed compelling advancements from key players such as Siemens, ABB, Eaton, Schneider Electric, and LS Cables & Systems, among others. India-based company C&S Electric Ltd acquired Netherlands-based company Etacom NV. With this acquisition, C&S offers a wide range of busbar products across the globe. Moreover, this acquisition increases the presence of the company in the European region. Similarly, ABB completed the acquisition of GE Industrial Solutions. This development is expected to enhance the company's electrification business segment, thereby contributing towards the revenue generated by ABB in the power distribution business, which, in turn, is anticipated to strengthen the company’s position in the electrification market. Furthermore, key manufacturers in the global busbar trunking systems market are significantly focusing on mergers and acquisitions in order to increase their presence in the global busbar trunking systems market. These key developments are expected to boost the growth of the busbar trunking systems market over the forecast period. The busbar trunking systems market is significantly consolidated, as tier-1 players or international players hold prominent shares in the global busbar trunking systems market. Tier-2 and tier-3 players account for significant shares in their local or regional busbar trunking systems markets. Organized players are trying to establish their footprints in developing regions. However, unorganized/tier-2 and 3 players in the busbar trunking systems market are focusing on launching new and differentiated products. During the course of research, we have conducted deep-dive analysis to develop a unique research methodology. Defining key objectives pertaining to the busbar trunking systems market during the course of research. Clearly defining the research scope, as well as collecting and analyzing the data from secondary and primary research. Using the triangulation method, and validating the data and market size. What is the historic (2013-2017) scenario of the busbar trunking systems market? Which type of material is preferred in the manufacture of busbar trunking systems? What are the main factors that drive the growth of the busbar trunking systems market? What are the prominent trends in the busbar trunking systems market? What are some of the key forecast factors expected to affect the growth of the busbar trunking systems market? How competitive is the aftermarket and market share analysis of the top players in the busbar trunking systems market? How are the key players expected to drive the busbar trunking systems market in the next 8 to 10 years? Power Plug Busduct Sdn. Bhd.